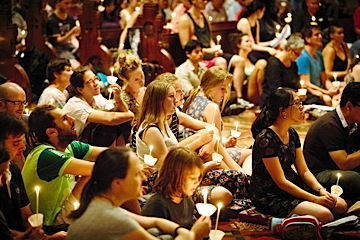 In the lead up to the community’s celebration of 2015, Brother Alois proposed in 2012 a three-year time of searching “Towards a New Solidarity”, in order to renew in the light of the Gospel our commitment to human solidarity and announced that during this period, gatherings would be held with young adults would be held on every continent. As he said during the European Meeting in Prague, after meetings in 2012 in Africa, 2013 in Asia and 2014 in the Americas, in February 2015 Brother Alois made the final stage of this pilgrimage to every continent by travelling to Australia and New Zealand, together with some brothers of the community. Below, one of the brothers tells the story of these visits. The first day in Melbourne saw us taking part in a welcome ceremony during a meeting with Catholic pastoral workers for the Aboriginal community. Vicki leads the group and her birth lands are around Lake Mungo, a site in New South Wales which has been inhabited for over 40,000 years. She had brought earth from the lakeside wrapped in a scarf belonging to her mother. The scarf was placed in a "coolamon", a hollowed out piece of tree trunk used to carry children, water and other precious things. She invited the indigenous people present to pour a little of the earth into our hands. We had to close our eyes and she prayed that the earth of the first inhabitants of this country might welcome us. We then had to pour back the earth into the coolamon. After this, we prayed together with songs from Taizé. One of the leaders said that meditative prayer was really part of their tradition. On the same day, we shared a pick-nick with the 15 or so young adults, all of whom have visted Taizé over the past years and come from several different churches. They had prepared for the next day a wonderful day of meeting with young people from all over Victoria and elsewhere. Morning prayer took place at Wesley Church, followed by Bible study. The pastor had been a volunteer in Taizé in the 1970s. Midday prayer was at St Francis Catholic Church, with workshops in the afternoon. Evening prayer was held in the Anglican Cathedral. The meal before was prepared by Burmese refugees. Sunday led us to Brisbane. Welcome by the Catholic Archbishop. He told how Br Roger’s writings have accompanied him throughout his faith journey. The prayer in the Cathedral was prepared by young adults many of whom barely knew Taizé, but who had learned very well the music. We set off the following morning for New Zealand. As soon as we arrived, we were taken by car two hours north of Wellington to the region of Otaki. In the village of Rangiatea, we were astonished to see 200 people waiting for us in the car park outside the church which is a kind of cathedral to the Anglican Maori community. The women started to sing and led the procession towards the church. The Maori priest and the bishop of Wellington gave us the traditional welcome. We then improvised a prayer with our songs. 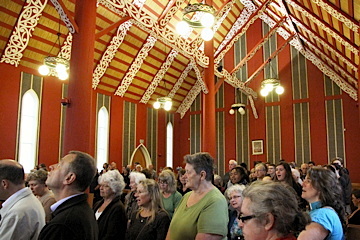 The church building is similar in structure to the Maori meeting halls. These are traditionally dedicated to an ancestor of the tribe. For Christians, this ancestor is Christ who gathers us in his body. The rafters and beams represent the ribcage of Jesus. The three main pillars signify the Trinity. The walls are bedecked with woven hangings on which there is a multitude of stars, sacred to the Maori, which recall also the promise made to Abraham and Sarah. At the end, the Anglican priest took us to the nearby Catholic church, the oldest wooden structure in the Southern Hemisphere, where we prayed in front of the “wall of reconciliation” in the courtyard. The site is very important to the Maori community. That evening, we left for the community founded by the Anglican bishop of Wellington out in the bush. We spent the night there. The Arche Community and several other people came to pray with us. In the early afternoon, we returned to Wellington. The Missionaries of Charity brought a group of young Pacific Islanders from a poor neighbourhood to the workshop in the Catholic Cathedral and then joined us for evening prayer in the Anglican Cathedral afterwards. At Christchurch, on South Island, the Anglican Bishop, Victoria Matthews, was waiting for us. She had already been twice to Taizé and welcomed us so well. She would like to bring a group of young people to Taizé in July 2016. We crossed the town, still wrecked due to the earthquakes of 2011 – the centre has become a huge wasteland, the two cathedrals are in ruin, many buildings have been destroyed. Many people are still affected by what they experienced. But it is marvellous to hear of the initiatives that have sprung up between Churches in the midst of the disaster, building solidarity. In the evening, a workshop and prayer were held in the Transitional Cathedral, (also known as the Cardboard Cathedral), rapidly constructed after the earthquakes by a Japanese architect. The prayer around the cross that evening was particularly intense. Return to Australia. On Friday, a day of reflection with students in a joint Anglican-Catholic school north of Adelaide – prayer, Bible study, workshops. Evening prayer in a Uniting Church in the city centre. A group of twenty young adults came from this church to Taizé in 2013. With them were 2 young indigenous women. Saturday: journey into the Outback – the huge plains that gradually turn to desert. Pilgrimage among the Adnyamathanha, literally “the rock people”. Auntie Denise, an elder of the nation and mother of one of the girls who came to Taizé in 2013, had been herself to Taizé in 1980. She told how in trying to translate our songs into her language, she had rediscovered a whole spiritual vocabulary belonging to her culture. Coming from an oral tradition, she has a wonderful gift of sharing stories of the “Dreaming”, the founding cultural stories which are not simply looking back to the past, but which still speak and act today. The link between the land and the inner life are primordial. The spiritual life of the ancestors prepared the way for Christ. God was with them before the Gospel was announced. Early Sunday morning, as the sun rose, Auntie Denise told us their story of the creation As the sun never fails to rise, without fail the light of Christ rises and helps us to see direction and guides our steps. Today the indigenous people are still being forced off their lands. 150 communities face closure because of government politics and the financial interest in the richness of the natural resources in the traditional lands of the first peoples. 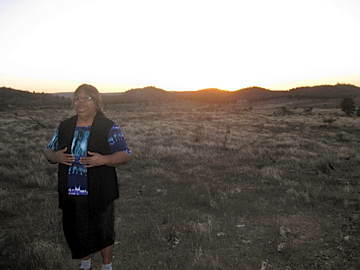 Auntie Denise prays “Jesus, remember me” because she feels that her people are forgotten. If you would like to read some of the feedback received from young people who took part in these gatherings, please look at News of prayers, meetings and gatherings. We would also like to publish on this page initiatives of solidarity involving young people from Australia, New Zealand and the Pacific islands. If you would like to share about your commitments, please write to echoes taize.fr.